Looking for that perfect furry addition to your family but struggling to pick a breed? There are many great dogs out there to choose from that fit your family’s lifestyle. If you’re searching white Golden Retriever puppies for sale, Golden Retrievers are great pets for active families. You’ll love having the opportunity to get to know the puppy as he or she grows up. If you still need a little more convincing, check out our list below. 1. Loyal. Golden Retrievers are especially loving, devoted dogs. When you go through white Golden Retriever puppies for sale and bring home your dog as a puppy, you bond with your dog from an early age. As that puppy grows up in a loving home, he or she becomes devoted to you and your family. 2. Active. These dogs were bred as sporting dogs, which means they love to be active. White Golden Retrievers love going for walks, playing fetch in the yard, and swimming. A Golden Retriever fits right in with a family who loves to hike and be outside. Maybe instead you’re looking to get more exercise? Golden Retriever puppies need regular walks. 3. Healthy. A long-established breed, Golden Retrievers tend to be healthy dogs with a life expectancy of 10-12 years. This means your puppy will be a member of your family for a long time. Although every individual dog is different, well-bred Golden Retrievers usually don’t have many significant health problems. When you’re looking at white Golden Retriever puppies adoption, find a puppy with a healthy, champion bloodline to minimize the risk of your dog developing major health problems. 4. Easy-going. Don’t confuse active for hyperactive. Golden Retrievers are naturally playful and energetic, but they also long to please. At Double B Goldens, we breed our most mellow dogs. 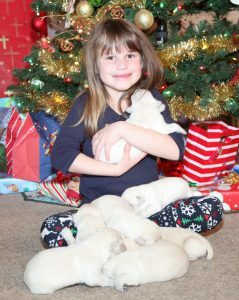 Our white golden puppies love to play but typically grow into mellow, easy-going dogs. 5. Good with kids. Our list includes many reasons why Golden Retrievers are great with kids. They are loyal and devoted, and they long to please even the youngest in the family. As active dogs, Golden Retrievers love to play with kids, but their easy-going nature means that they won’t be too aggressive or hyper. Also, white goldens are generally tolerant dogs. They’re willing to put up with very young kids even when they tug on their ears or climb on them. If you’ve decided a Golden Retriever is the right breed for your family, we strongly suggest white Golden Retriever puppies for sale through a responsible, certified breeder. When you bring home a puppy, he or she will grow up with your family and adjust well to your family dynamic. Going through a reliable breeder ensures that your puppy has been responsibly bred and has healthy parents.